National Compost Awareness Week runs from Monday 5th to Sunday 11th May. A variety of events and activities are taking place throughout the county to celebrate the magic of composting! To celebrate the week and to thank Suffolk residents for supporting green waste recycling services, officers will be giving out free bags of compost, whilst stocks last, to Suffolk residents visiting selected Household Waste Recycling Centres across the county. Composting is nature’s way of recycling organic materials to make a nutrient-rich soil improver – to help your garden bloom and your vegetables flourish. You don’t have to be green-fingered to feel the benefit – by making use of your garden and organic kitchen you’ll be doing your bit to help the environment by making peat-free composts containing recycled material. When sent to landfill, organic waste breaks down without oxygen, producing methane which contributes to global warming. An average household in Suffolk could divert 150kg of organic waste a year from landfill by home composting and significantly more if you use a composting system which deals with cooked food waste as well! 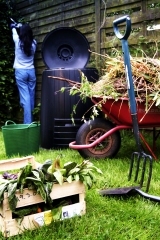 There will be a number of ‘Compost Clinics’ during the week where Suffolk Master Composter volunteers will be ‘on call’ to show residents how to compost at home and to offer free trouble-shooting advice. Further details can be found on http://www.suffolk.getcomposting.com or by calling 0844 571 4444 .